My original intent had been to keep these experimental socks for myself but as they turned out to not fit me all that well I've decided to give them to my mil. The seed stitch worked well with this yarn I thought. Good to see you are back. 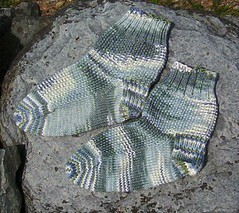 Love the experimental seed stitch socks. Isn't that fun? Great socks! The pattern is great with the yarn colors! The socks are lovely! Your mil is lucky that they turned out not to fit you!